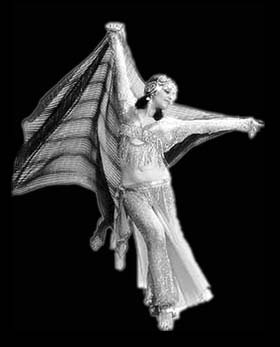 Before there were stiletto heels, kiss-proof lipstick and push-up bras, there was belly dancing. But belly dancing is about more than just titillation. In fact, it originally was performed in the Middle East for women by women; a distinctly female mode of self-expression and celebration. When the dance crossed over to the west and men were invited to the celebration, however, belly dance's exploration of the female form took on a new meaning. Blame it on Little Egypt. The diminutive dancer became the scandal - and the big draw - of the 1893 World's Fair in Chicago. In the buttoned down and corseted up Victorian era, here was a woman who barkers could tout by shouting that she "shakes like a jar of jelly from your grandmother's Thanksgiving dinner." Soon, her "hootchy cootchy dance" became a staple of burlesque houses and there were Little Egypt's shaking their moneymakers across the country. As belly dance became the exotic spice occasionally added to Hollywood movies, it accomplished a reverse migration and changed the genre in the Middle East, where it became a performance dance in cabarets instead of a communal one at gatherings. A second wave of popularity in the U.S. in the 1970s brought the genre back to the people. "Suddenly, it was all over the place," said Anahid Sofian, who started her Manhattan studio in 1972. "It's great exercise and great fun. Women were just doing it for themselves." 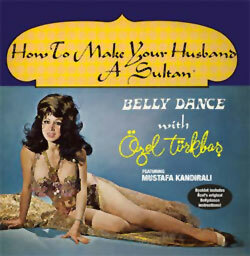 One of the sparks for belly dance's resurgence was the release of the album How to Make Your Husband a Sultan by Özel Türkbas. The album sold 150,000 copies in the U.S. and landed Turkbas on national TV shows. The album is now being re-released on CD by Traditional Crossroads with all its original kitschy artwork, including a series of photos of Turkbas demonstrating belly dance moves. Turkbas, who now lives in Lido Beach, said "I was born into it," in her native Turkey where her mother was a professional dancer and, in the traditional manner, taught her daughter. "My mother used to play [the oud and dance] at weddings," Turkbas recalled. "Mostly there were women in the audience. The men were together somewhere else." Despite the pre-feminist, woman-as-harem-girl vibe of the album, Sultan featured high-quality musicianship since it was performed by top-notch Turkish musicians who happened to be passing through New York where Turkbas nabbed them for a day or two. The re-release of "Sultan" comes during a new resurgence in belly dance. According to Sofian, this latest trend has a different twist to it: many of the newcomers want to become professionals. "It's a mixed blessing," Sofian said. "It's great that there's this enthusiasm. But there are virtually no standards left in the field." In the '60s and '70s, Sofian said, "you had to be good to get a job. It wasn't enough to have a nice body and be pretty." According to Melissa Michalak, who has been dancing professionally for several years, there are "hundreds" of women in the area who consider themselves professional. Considering the small number of venues, the restaurant owners are often all-too-happy to pay little or nothing to an eager newcomer. Top dancers, she said, fear publicizing their gigs for fear that cut-rate competitors will dance away with the job. Exoticism aside, Sofian noted that "danse orientale" has some fundamental differences from western dance. She calls it "more introspective," noting that dancers explore isolated movements, particularly of their arms and torso, and do not move a great distance. No reproduction of any part of this page or its associated files is permitted without express written permission.